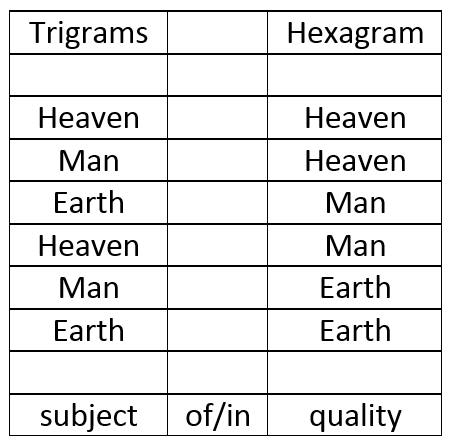 Nuclear hexagrams are made from the inner trigrams of a hexagram. The lower inner trigram consists of lines 2, 3 and 4, the upper inner trigram of lines 3, 4 and 5. This means that in all nuclear hexagrams lines 2 and 4 are similar, and lines 3 and 5 are similar. So if line 2 is yang, line 4 is also yang. Like in hex.40 at left. Only 16 hexagrams have this set of similar lines: 1, 2, 23, 24, 27, 28, 37, 38, 39, 40, 43, 44, 53, 54, 63, and 64. They are hexagrams of the Yi but also nuclears of hexagrams. There are always 4 hexagrams which share the same nuclear. 40, 64, 54 and 38. In this case hex.40 also has hex.40 as nuclear. This is only the case with hexagrams which are nuclears themselves for other hexagrams. The nuclear of hex.3 is 16. Hex.16's nuclear is 23. But the four hexagrams which share 23 as nuclear are 3, 8, 20 and 42. No 23 there. A list for finding the nuclears. When finding the nuclear, that means that you shove lines 2 and 4 together and lines 3 and 5. Relations 2 and decisions 4. 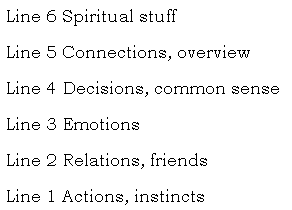 Emotions 3 and connections 5. That must have a meaning. Line 3 is trigramline earth and hexagramline heaven. It is the combination of man and heaven, man and his spirit: emotions. Now this line gets connected with some kind of complementary line 5, man in the realm of spirit. Quality can be surroundings, hormones, anything which affects how or in what creatures or things are affected or behave. Heaven is everything not tangible: mind, emotions, spirit. Earth is solid, matter, the body, hormones etc. Heaven and Earth cannot be combined, but both can be combined with man. Man and Heaven: emotions, mind. Heaven and (in) Man: wisdom, insight. Man and Earth: sense of reality, decisions, knowledge. Earth and Man: (connections with) the people around you. Man-man makes no sense, Man has to be combined with some property to be meaningful, either as part of humanity or as individual. In the nuclear the two lines, which overlap each other now, are complementary. Line 3, heaven-man with line 5, man-heaven. Line 2, man-earth with line 4 earth-man. Man lives on earth, but there is also earth in man: sense of reality, inner connection with tangible surroundings. So there is a sense of mutual connection between man and the earth, and also between man and heaven. How does this make sense in a hexagram? Eg hexagrams 3, 8, 20 and 42, the "family" of their common nuclear hex. 23. According to Hilary the nuclear family shows "the potential inside the cast hexagram, but also their inner work". So 3, 8, 20 and 42 are potential and work of 23. Which does make some sense. Pruning a rosebush means new beginnings, an overview of how you prune, and increasing the roses. Only what hex.8 does is a bit unclear in this family.